Architects and architectural corporations can target key demographics and establish projects within the residential market by using this free, printable business plan. 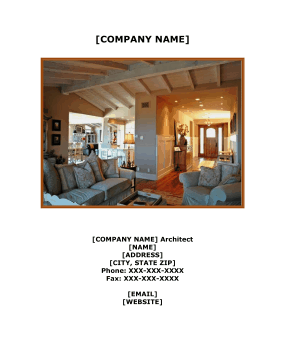 [COMPANY NAME] Inc. ([COMPANY NAME]) is the expansion of [COMPANY NAME], a professional architectural corporation. [COMPANY NAME] shall be located in the office of [COMPANY NAME] in [CITY], CA. [COMPANY NAME] shall expand the services to include environmental and sustainable design and applications for the private and public residential market. These expanded services shall include project evaluation, recommendation and design of existing projects for sustainable rehabilitation and new projects. In addition, [COMPANY NAME] shall purchase inexpensive properties in established neighborhoods or "in the path of growth" for sustainable rehabilitation for marketing and educational purposes and profit. • Expand [COMPANY NAME] and the public's knowledge and awareness of environmental and sustainable architecture. • Become "the source" for environmental services. • Create manufacturing, service and construction jobs. • Create awareness in the public of the "reduction of environmental impact" the construction industry could have now and in the future with creative and sustainable construction design, methods and materials. • Create a marketing and profit path to expand and grow [COMPANY NAME], attracting the brightest employees. Keys to the success of this plan have already been developed over the past 24 years of service by [NAME] A.I.A. • Quality and professional service respected by the construction industry. • Experience in the construction industry not only as an Architect but as a practitioner of Landscape and Interior Design and is a Licensed Contractor. • A noteworthy recipient of awards and publications, resulting in name recognition and a leader in the local community. • An enviable list of clients, consultants, suppliers, contractors and real estate agents developed over the past 24 years who promote and support [NAME]'s services. • 24 years of financial responsibility both in business and in understanding project financing allowing [COMPANY NAME] to grow and thrive over the years and his projects to be built. • The support and dedication of a core staff who have faithfully completed his "vision." These key qualities shall be used to expand [COMPANY NAME] to including environmental and sustainability services by creating the division [COMPANY NAME] Inc. The funding shall provide the opportunity for [COMPANY NAME] Architecture to provide a positive difference for our clientele and the community by providing consulting and project development. A direct affect shall be to allow us to provide effective consulting that can be used to make their personal and business environments more efficient and sustainable. The goal of the consulting efforts shall be to enhance the client's lives, reduce their costs and enhance their environment. • Provide increases and stable quality employment for [COMPANY NAME] and the local construction industry from laborers, local professionals, trades, suppliers and manufacturers, all while improving the environment.